It was only a matter of time before the youngest of children were swept up in the DVD craze that we are currently enjoying. Leave it to Disney to involve those kids in the form of their Baby Einstein series of DVDs. These discs feature a main program with an educational theme, usually focusing on a world-renowned composer and/or artist. Baby Monet—Discovering the Seasons features a half-hour program with wonderfully cute animal puppets who prance about the screen in a way that kids will enjoy over and over again. In fact, the best feature of this disc is the choice to play the program repeatedly just by choosing that option on the main menu screen. The content of this program revolves around teaching kids (the package says this is for kids who are six-months-old and up) what happens during the four seasons. In order to teach this, the wonderful art of Monet is on display almost all the time. The only real dialogue in the program is a child who says the names of the seasons when the puppets are about to perform their next skit. As a parent, I was overjoyed to pop this DVD in and see what my one-year-old would do with it. She loved it, standing at attention to these adorable puppets and taking everything in during the entire 30-plus minutes. This is the first Baby Einstein DVD that she's experienced, but it definitely won't be the last. The only complaint is the shortness of the main program, but that's where the repeat function comes in very handy, not to mention the nice, full-motion extras that are also included. Image Transfer Review: The full-frame presentation is up to the high standards set by other Disney DVD releases—there are bright, colorful, kid-friendly images during the entire program. The colors practically jump off of the screen, mesmerizing kids with ease. There aren't any flaws with the presentation at all, with no grain, dirt, or other blemishes rearing their ugly heads. Audio Transfer Review: The 2.0 audio here makes surprisingly aggressive use of the surrounds, allowing the child watching the program to really become involved with what's happening on the screen. There isn't much dialogue at all, but what is here is easy for kids to hear and understand. The music and child-like sound effects are the main focus, and these come across great over all of the speakers. Discovery Cards: A collection of still photos from Monet and a full-motion lesson on learning how to say the twelve months of the year in English, French, and Spanish. A Look at the Seasons: An 11-minute piece with the zebra from the feature showing images that kids would see during the different seasons throughout the year. Puppet Shows: A collection of three puppet shows with different, seasonal themes. Toy Chest: A collection of still photos representing toys from Baby Monet that can be purchased on the Baby Einstein Website. Extras Review: There are some nice extras on this DVD, including some interactive elements that kids can enjoy both with their parents, and by themselves. This nice mixture of still photos and more puppet fun only add to the excellent teaching tool that this DVD turns out to be. About Baby Einstein is a four-minute featurette with testimonials with parents and kids who discuss just how valuable the Baby Einstein series has been to their child's development. A narrator also goes over what this wonderful series is all about, and breaks down the different titles and what age group they're appropriate for. Forget Barney and other kid-oriented programs. 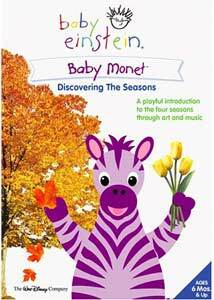 Baby Einstein: Baby Monet—Discovering the Seasons is not only an entertaining way for your toddlers to experience DVD, it will also teach them a thing or two along the way.